The new hit single from the Big Man who’s making a Big Hole in Christchurch buildings. There’s been quite a bit of coverage of the Auckland unitary plan – and the way that certain elements of the media are covering it. Russell Brown at Public Address has done some great tear-downs of the nasty anti-plan campaign, both on twitter and in this blog. He has also got a guest blog on the site from Sudhvir Singh, which I enjoyed reading this morning. I think it’s great that a group like Generation Zero have waded into the debate, with opinions and passion. I haven’t read the Metro special on the plan, but I did read the article that went up online here. Someone could be writing a similar Dream for St Martins, with the same sort of vision. It was also with some regret that I read this debate. While I think it’s terrible that the country’s so-called newspaper of record will wade in so one-sidedly against the plan, at least you get to have a debate on the plan. I was going to say I’m sorry for always bringing this back to Christchurch, but actually, I’m not sorry. What I wouldn’t give for a debate – however biased on one-sided it might be – about the future of our city. Some of the arguments that Singh made – about density, about how to create neighbourhoods that young people want to live in, about reducing our reliance on cars – were ones that we should be having in Christchurch. Well, some are having those arguments. But we have no plan to feed into, no say in how our city will be shaped. A few things were handpicked from the more than 100,000 ideas that were submitted via Share an Idea. We can submit to the council about stadia, convention centres, cycle ways, ideas about housing and zoning – and the Minister can throw them in the bin to replace them with whatever evidence-free proposals he likes. The city council has effectively been neutered, and they know it. Candidates can run for October’s election, standing for whatever they like, knowing they have an almost zero chance of being able to implement any of it. No matter, we can take the matter to our regional council, right? Oh, the one that had their councillors removed in 2010, that we won’t be able to vote for until 2016? Cos actually being able to have a regional council that represented our views on water management, as well as land zoning in the market gardens and farms around Christchurch that are being ripped up as fast as the bulldozers can go to put in endless subdivisions would be quite useful at this point. I’m sure you know all this. Well, I hope you do. I’m not knocking the people campaigning for and against the plan. I’m encouraging you. I’m envious, really. You get to have all the heated, spurious, fact-based, hate-filled arguments that shape cities. We don’t. While it might be hard, even infuriating at times, at least you get to have it. You don’t know what you’ve got till it’s gone. While we may never have been paradise, that didn’t stop them covering the place with parking lots. 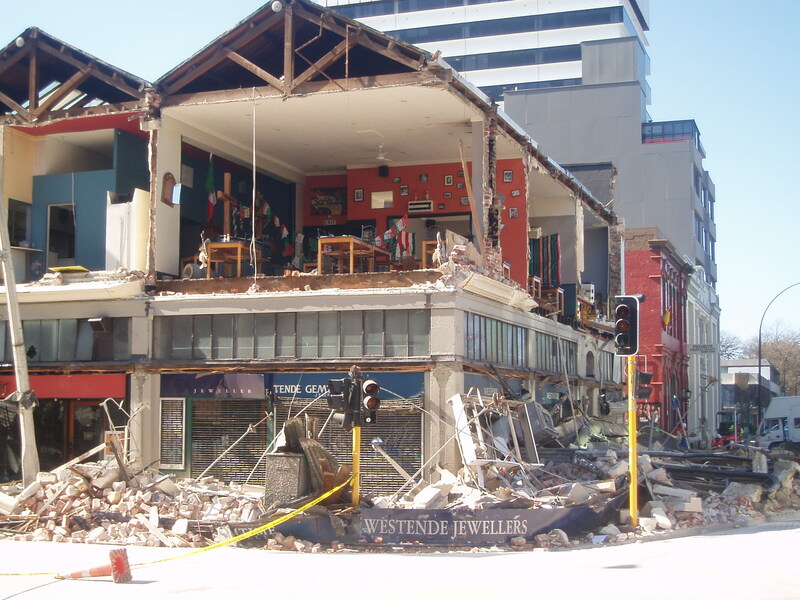 Since the earthquake on the 4th of September, I have become increasingly concerned that we are about to lose great swathes of the cities heritage – without really having much of a say in the matter. We are now presented with the greatest opportunity to rebuild and reshape a city that we will have for a generation – possibly more. We can make Christchurch a modern, 21st century city. If we take the cheap option, or the laissez-faire option, or the fastest option, we may stick the final nail in the central city of Christchurch’s coffin. I don’t want to see that happen. I do not object to modern architecture. When you look at a building like the Public Art Gallery, you can see that a well-designed building can make a real difference to a city; it has revitalised an area of town, it’s survived a massive quake better than I think most people would have thought a building made of glass would have, and it has rapidly, seamlessly turned into the civil defence head quarters for a city in crisis. What I do object to are hastily assembled buildings that are erected without consultation with the community. We may not own a building, or have anything to do with what goes on inside it. But if it goes up on our street, then it becomes part of our lives. We can preserve our heritage buildings. Not all of them. Maybe not even half of them. But a number of them. When you do the sums, it may make far more sense to knock down a building and start again. I am not going to argue with the building owners about this. I’m sure it is more affordable to just knock something down and start again. To save these buildings, we need to have council and central government putting up money to make it happen – because building owners around the city will be just looking at the bottom line. This is capitalism, and capitalism isn’t very good at factoring emotions and memories into the bottom line. But if we can put some money up to save some of our best buildings, then their value will be doubled in our new Christchurch, and while that may not have immediate monetary value, it will in time bring small but measurable revenue in by increasing tourism to our city, and quality of life for the people who live here. I believe that we want to create a city that is ready to adapt to the challenges of the 21st century, not react to the problems of the 20th. We need design a city that is no longer dependent on fossil fuel, for heat, for personal transport, for the transport of the necessities of life. We need to think about our warming climate, and what that will mean for the buildings we are to live in. We need to have a discussion about population growth, and density. How many people do we want to live in this city, on this island, in this country? We need to think about how we can reconnect people and families to each other, to create a society again – not just networks of strangers who interact via the internet. We need to accept that “sustainability” and “growth” are not concepts that are mutually compatible with each other – and decide which one we want. I personally side with sustainability, and if that means that we live in a society where we have fewer things and consume less, but have more time to spend growing our own food and being around family and friends, then that’s a choice I am comfortable to make.